Regardless of their individual place in history, “President of the United States” is a very exclusive club. 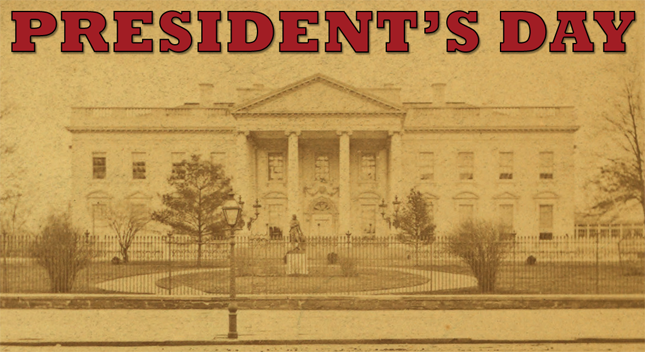 In honor of President’s Day, we are featuring inventory related to our greatest presidents as well as some presidents of more modest accomplishment. Be sure to see our signed portrait of Franklin Delano Roosevelt from his 1932 presidential campaign, an extremely rare William Henry Harrison document signed during his 30-day presidency, a Lincoln-signed military commission, a letter from Warren Harding praising America’s post World War I return to a peacetime economy, and a bronze plaque of Theodore Roosevelt featuring his famous “strenuous life” quotation. 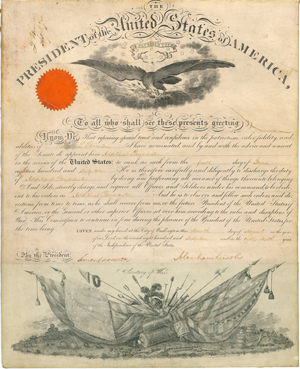 Passed on June 1, 1796, An Act regulating the grants of Land appropriated for Military services, and for the society of the United Brethren propagating the gospel among the Heathen made accommodations to survey and sell land in the Northwest Territory. This particular act enabled the President to grant land in the Ohio Valley to former Continental Army soldiers for their service in the Revolutionary War. The relationship between the United States and France takes a personal turn as Adams leaves a friend’s grandson in Franklin’s care. 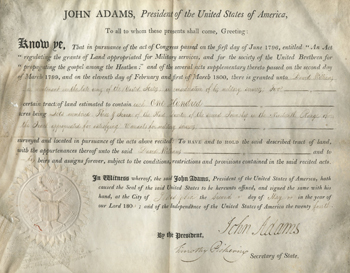 A handsome vellum patent document, signed by Adams as President, is accompanied by the inventor’s two-page description of his device. At the height of the U. S. diplomatic crisis with Spain over Florida, Old Hickory makes plans to return to combat in Florida while venting his rage against Treasury Secretary William H. Crawford. 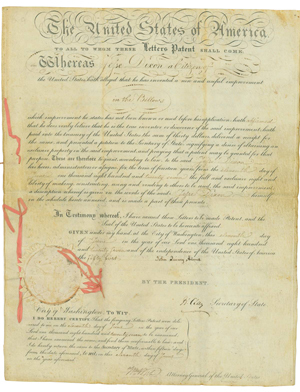 In this detailed letter, Martin Van Buren instructs the United States Chargé d’ Affairs to Buenos Aires to inquire into the Governor of the Falkland Islands’s warning U.S. fishing vessels to stay clear of valuable whaling and seal fisheries in the area. Harrison’s death from pneumonia after 3o days in office makes his tenure the shortest of all the presidents. 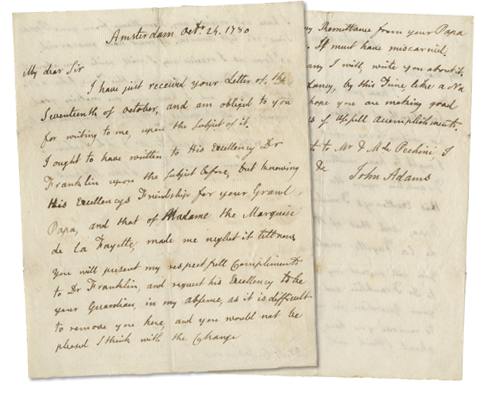 Our current census finds fewer than 40 Harrison documents (including signed and unsigned letters, free franks, and clipped signatures) as president in any format, many of which are in permanent collections. 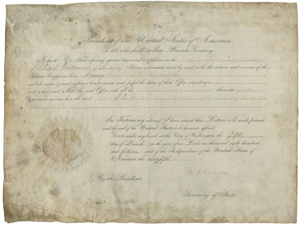 President Lincoln appoints Charles S. Stevenson of Indiana “Additional Paymaster” with this signed, vellum commission dated August 7, 1861. 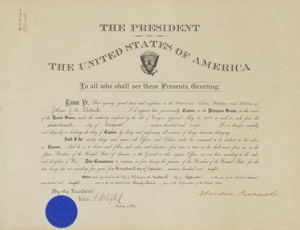 President Roosevelt commissions John J. A. Clark as Captain in the Philippine Scouts, a group organized by the U.S. Army to combat the Philippine Revolution. 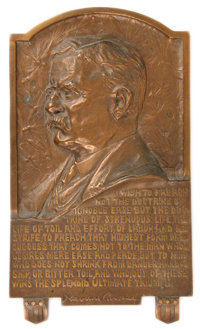 Roosevelt’s personal philosophy of life is cast in bronze under his profile portrait in bas relief, followed by a facsimile of his signature. As honorary chairman of the National Committee on Food for the Small Democracies, the former president tries to rally support to aid the women, children, and destitute in those European nations affected by World War II and save them from the inevitable famine and pestilence that confronted them. 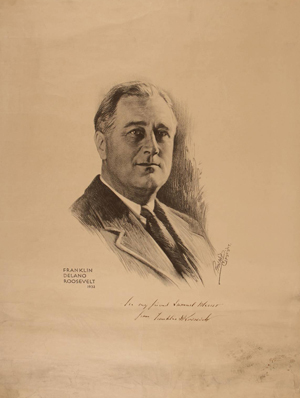 This image of President Roosevelt was the official portrait for the 1932 campaign. It was drawn by Jacob H. Perskie, the photographer and portrait painter for FDR in the 1932 and 1936 presidential campaigns. It is inscribed to Samuel Messer was one of the largest stockholders of Quaker State Oil Refining Company.